I haven't talked #paperhaul in a while thanks to taking a little break from blogging, but when October's 'Shades Of Shibori' box fell through my letterbox last week I knew I wanted to share a few snippets of it with you. 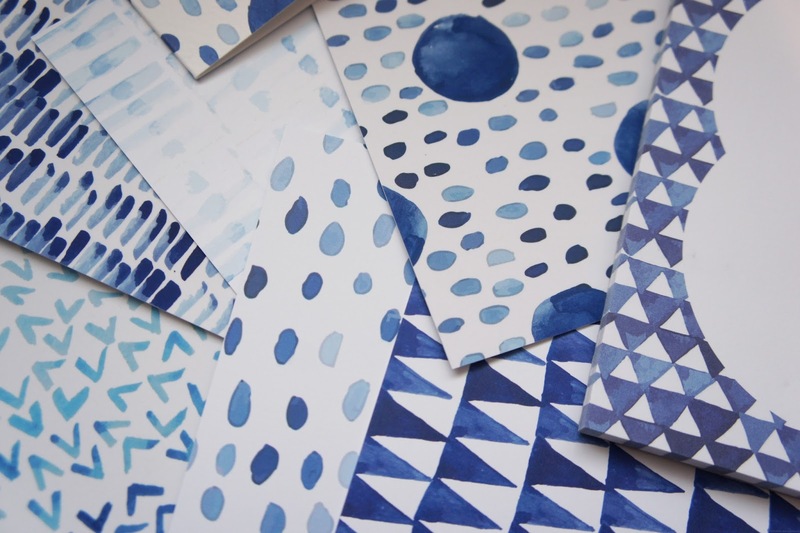 Inspired by the Japanese fabric dyeing technique known as shibori, this collection of paper goods showcase a whole range of beautiful blue tones (that happen to blend in well with my new blue-grey walls!). Contrasting against the white backgrounds, the blue patterns are playful, bold and work together as a collection perfectly. Aside from the simple colour palette, I particularly love the soft watercolour style mark-making and the wide variety of prints all created using simple shapes. As far as the individual pieces go, it's difficult to pick a favourite as there is such a range of different patterns but I love how the trio of mini notecards and trio of postcards (pictured above) compliment each other. This box is definitely one of my favourite editions of #paperhaul I've received lately, perhaps even my favourite of the year so far! If you're interested in treating yourself to the next box you can sign up at Crafty Creatives for just £10 a month. If you missed my last #paperhaul post you can find it here. Welcome to A Natural Detour! © A Natural Detour. Design by FCD.